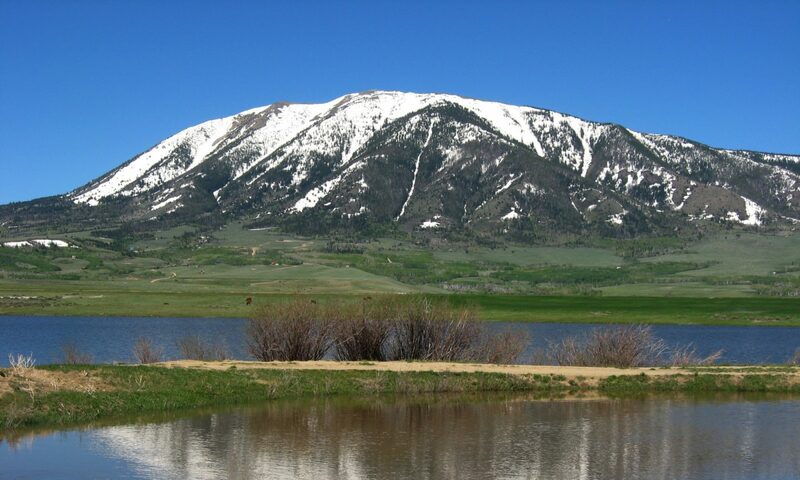 Water Rights - Wyoming Water Rights Consulting, Inc.
WYOMING WATER RIGHTS CONSULTING, INC. is dedicated to helping Wyoming’s water users fully identify, develop, utilize, perfect and protect their water right assets. We have designed our water rights services to detect and correct any discrepancies between the client’s water rights of record and their actual use of water – before those situations become serious problems. It has been our experience that water users are only using 60-80% of their water rights. 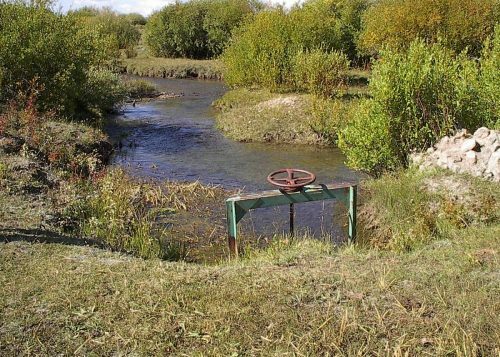 Further, the water rights too often do not reflect the water facilities that exist in the property. Whether you are purchasing a property and need due diligence assistance; or the ranch has been in the family for generations, we can serve your needs! ADVISORY SERVICES – we’ll answer your questions in plain Wyoming English – questions you may be hesitant to ask government officials. Use our expertise and experience to assist you with making the right decisions about your water rights and water use. Give us a call! WATER RIGHT SEARCHES – identify the water rights of record attached to the property. We prepare a Water Rights Abstract containing the water rights documentation and our determination of the specific water rights, or portions of water rights, that are appurtenant to the lands described on the deed. We can inventory all or specific types of water rights (depending upon your needs) affecting any identified parcel of land. Searches are performed in the Offices of the State Engineer and State Board of Control by employees of Wyoming Water Rights Consulting, Inc.
WATER RIGHTS ASSESSMENTS – compare the water rights of record with the actual historic use of water on the property – our experience and techniques allow us to fully identify the water rights of record, or portions thereof, which have been maintained by beneficial use. We provide specific recommendations for using and protecting your water rights. Life is too short to live it without a fish pond! Give us a call! WATER RIGHTS MANAGEMENT PLANS – we provide you with a comprehensive and practical strategy for perfecting your water rights while incorporating your water needs and land use objectives. We identify and schedule actions necessary to fully develop and perfect the water rights asset for the continued benefit to the property owner. Differences between the water rights of record and the actual water systems and uses of water on the property are identified. Recommendations are provided for resolving these situations in the best interests of the client. Further, we are available to assist you with any needed improvements on the ground and with all appropriate water rights changes / additions to serve your water needs well into the future. 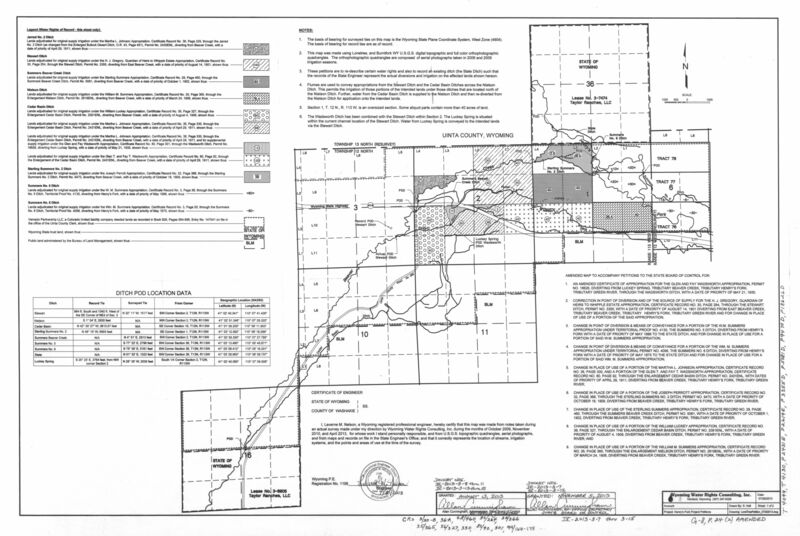 COMPOSITE MAPS – show the water rights of record, irrigated lands, ownership, etc., providing a practical tool for managing the water rights asset of the ranch. We utilize the latest computer-aided drafting, GIS, and graphics software coupled with state of the art technology to create accurate, colored maps showing the water rights, irrigated lands and/or other pertinent resource data. Our maps incorporate a USGS topographic or aerial photographic background as a user-friendly management tool. NEW WATER RIGHTS APPLICATIONS/PETITIONS – are prepared and filed for any beneficial use of water. WWRCI works with the State Engineer’s Office and State Board of Control staff to facilitate efficient and favorable outcomes through these water right processes. We have prepared hundreds of water rights applications and petitions! Our procedures help ensure the client ends up with the water rights they really need and where they need them! 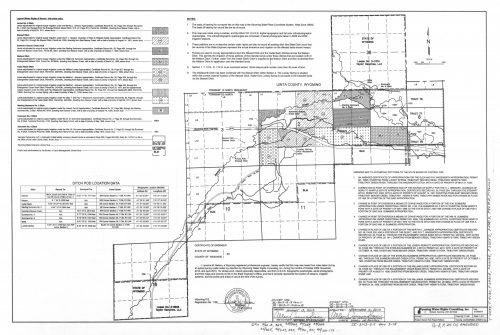 The following examples are maps that are of public record filed in the Wyoming State Engineer’s Office. 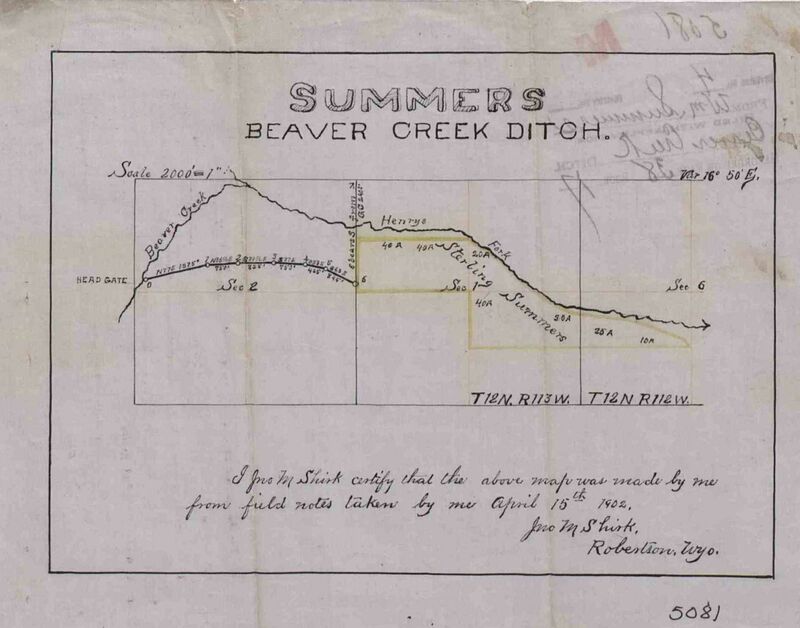 Irrigation application map dated August 15th, 1901. Click image for larger view. Irrigation application map dated April 15th, 1902. Click image for larger view. 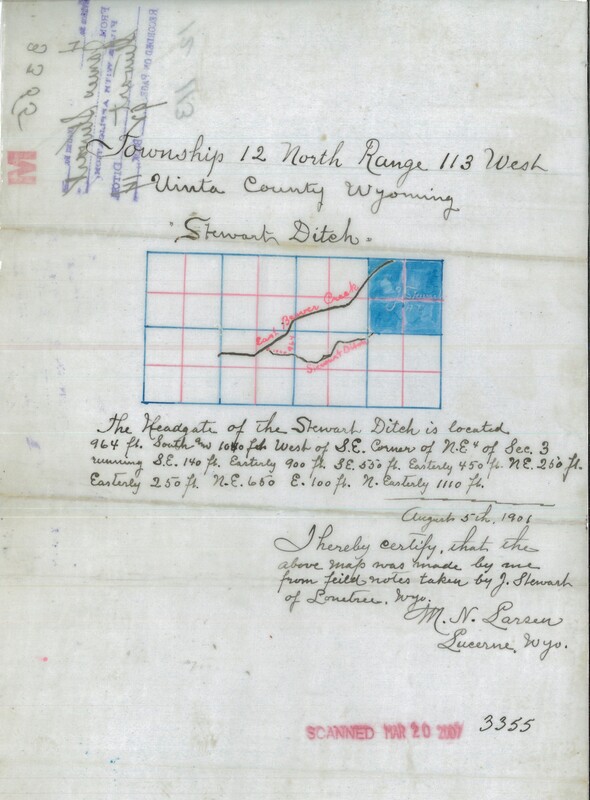 Many of the water righted lands in Wyoming are recorded in the State Engineer’s Office on maps such as the two examples above. Many territorial (pre-statehood) water rights were recorded without a map, survey, or field inspection. They often include a “blanket” land description, which can be vague. 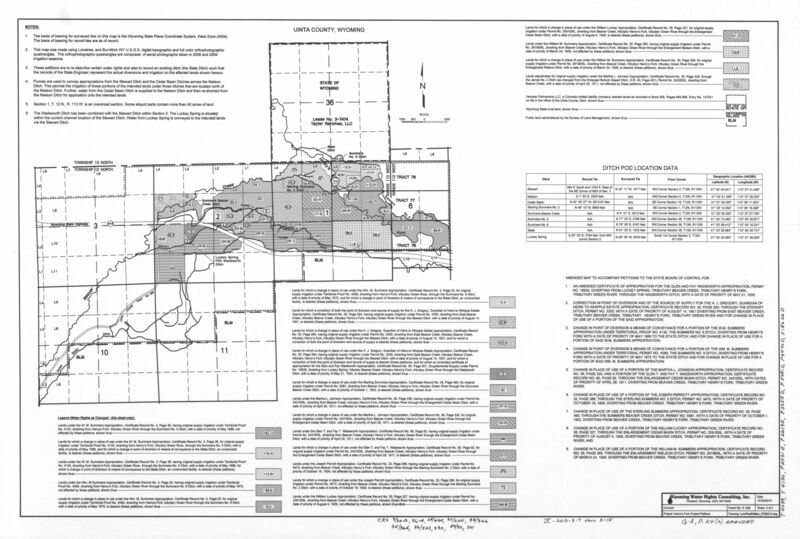 The “of record” sheet of the petition map shows the lands as they were described on the original water right documents. Click image for larger view. The “as changed” sheet of the petition map shows how the water rights have been re-described to fit the present day use and needs of the client. Click image for larger view. WWRCI prepares detailed, accurate maps showing both the “of record” and “as changed” water rights for the client’s property. Our petition efforts and these maps perfect the client’s water rights! WATER SYSTEM ASSESSMENTS – We can determine whether you’re getting all of the water that you are entitled to through your irrigation system. 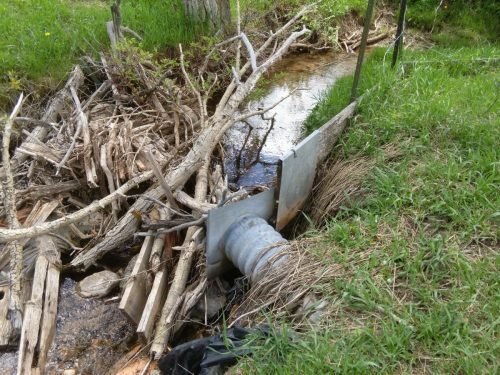 Many ditches suffer from problems associated with less than optimal diversion/headgate structures; improperly working flow measurement devices; down-ditch bottlenecks (undersized or damaged culverts, debris buildup and other obstructions); and lack of regular maintenance. If you cannot divert and deliver all of your available water to your field, you are not producing what you should! We can help you divert and convey all of the water to which you are entitled whenever it is available. We can also help you accurately measure your water. See our Water Measurement page for more information. INVESTIGATIONS – WWRCI can research and make determinations of proportionate interests / ownership of ditches, reservoirs, wells and other water facilities and water rights. We can also investigate the capacity / functionality of water systems concerning water system assessments and management; as well as water delivery and use issues. LITIGATION SUPPORT – Mr. Rhodes is available to attorneys as an expert witness on water, water rights, irrigation, water management and measurement, ditch and ditch rights, reservoir interests/ownership, Section 404 of Clean Water Act, and related issues. Todd and his staff work with counsel, complete investigations and produce exhibits to demonstrate the facts and their investigative findings. Mr. Rhodes’ comprehensive approach, analytical skills and problem-solving abilities have been key to the outcomes of important water cases. Todd and his team have extensive expertise and experience in the water, engineering and land surveying fields. All of our professional services are easily tailored to suit your individual needs. Please feel welcome to call us to discuss you needs. WYOMING WATER RIGHTS CONSULTING, INC. is not affiliated with any form of local, State or Federal government. WWRCI recognizes the sensitivity of client information. All water right reports and evaluations are strictly confidential and are maintained solely for the client’s interest.